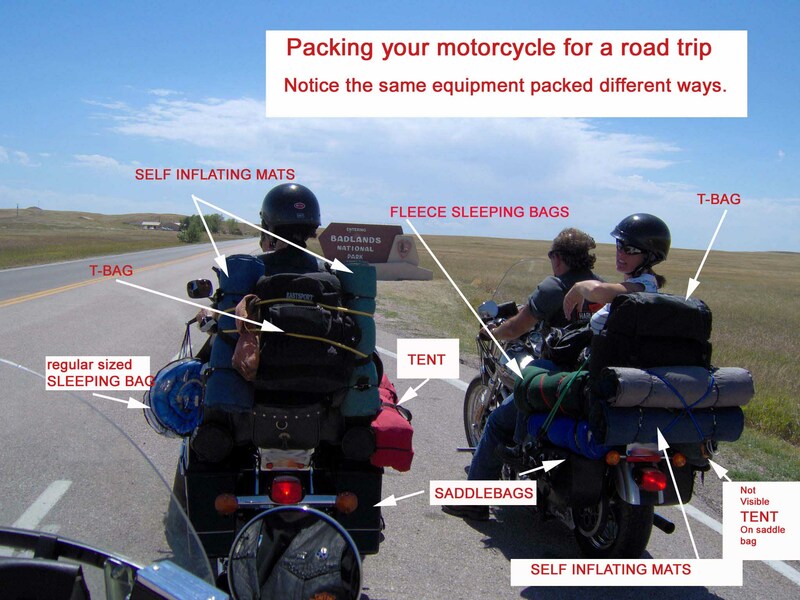 motorcycle, motorcycle pre-trip checklist, and road trip gear page. __ Windshield (Strongly recommended) You may need to chop your windshield for maximum visibility. __ Wool sheepskin seat cover - RidersInfo recommends the 'pelt' type as is doubles as a pillow. specifically for motorcycles if you need recommendations. __ If you have prescription medication of any kind, don't forget it! __ Clothing - Keep it simple, a couple pairs of jeans and a few t-shirts will do! motorcycle and weight and girth is very important! To see how this all looks packed, click here for picture. For best printing results, use the 'shrink to fit' option within your printing program.